In a mortar, pound the garlic to a paste with the brown sugar and green curry paste. Add the lime juice, fish sauce and water. Stir in 1 teaspoon of the cilantro and 1 teaspoon of the mint. In a small bowl, whisk the mayonnaise with 1 tablespoon of the green curry dipping sauce. In a large bowl, toss the coleslaw mix with the pork loin and remaining cilantro and mint. Fill a pie plate with warm water. Dip a rice paper wrapper completely into the water and soak until flexible, about 5 seconds. Remove the rice paper to a flat work surface covered with a dish towel to soften, about 1 minute. Spread a teaspoon of the curry mayonnaise on the bottom third of each wrapper and top with 3 tablespoons of the pork filling. Roll the wrapper into a tight cylinder, tucking the sides as you go. Transfer the roll to a platter and repeat with the remaining wrappers, curry mayonnaise and filling. Be careful that the spring rolls do not touch each other or they will rip. Chill the spring rolls in the refrigerator. 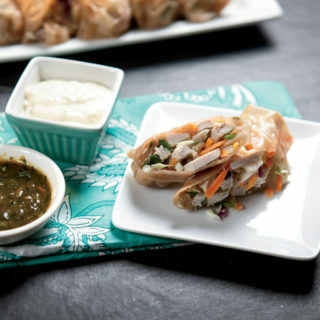 Just before serving, cut each roll in half and serve with dipping sauce.